You don't need to game saying thank-you. Recognition is best when its timely, simple, and a regular part of your week. 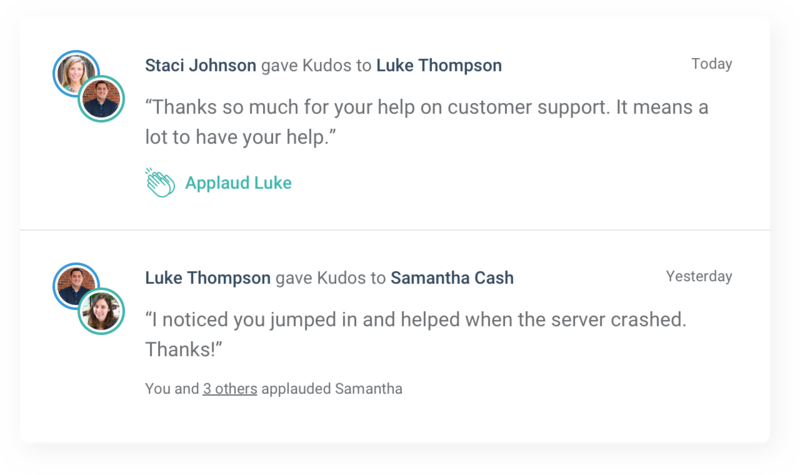 As part of the weekly update process, team members have the opportunity to send kudos to colleagues for a job-well-done. We don't overcomplicate it, force it into strict categories or make it about money or earning points. We let it be about the simple act of saying thanks to a work friend and we think that's better. Saying thank you shouldn't be about earning points or being forced to validate a "core value." Asking about recognition in the context of a weekly update drives relevancy and cuts down on noise. Seeing recognition activity alongside weekly updates and 1-1 meetings provides meaningful context.